Continuing our review on the indicators that matter, we'll revisit our second most important economic indicator, that is, the Case-Shiller 20-city composite home price index. This index is a 3-month moving average of house prices lagged two months. So the recently published index for January 2012 is in fact an average of November, December 2011 and January 2012 home prices. The Case-Shiller may be a laggard but it compensates for the delay with accuracy. This index at left confirms that home prices are still setting new rock bottom records despite the spate of favourable economic news on other fronts. In a depression, house prices can collapse by at least 50% from their peaks, last reached in the US in April 2006. The country with the worst performing state of real property is now Ireland where prices have gone down by 57%. In the US, the drop is a whisker short of 34%. That means prices have another 16% to fall from their peaks, or about 25% if based on current prices. To be sure, Ireland had a mad building frenzy. The US also had a similar craze but of a refinancing variety. Going by the slow pace of property price drop, thanks to Obama's massive deficits, the prices will only hit bottom by the end of 2017. There's still a long way to go before we can see a real normal. Of course, reality will arise much sooner since the US government does not have that much stamina for sustained massive deficits. With a new wave of foreclosures that is expected to set a more rapid pace than those of the past four years, house prices will be more depressed in 2012. Unlike in the past in which the subprime mortgages were the prime target, this time it's the ordinary mortgages that will be hit. In the fourth quarter of 2011, more than one in four homeowners were under water. Moreover, last year was the year in which proceedings were initiated and this year will be one in which settlement has been reached, allowing the banks to begin foreclosures. Sales of foreclosed homes will increase to 1.25 million this year from 1.0 million last year. Because of the way it is calculated, the Case-Shiller index provides a pattern that is not distorted by short-term fickleness. 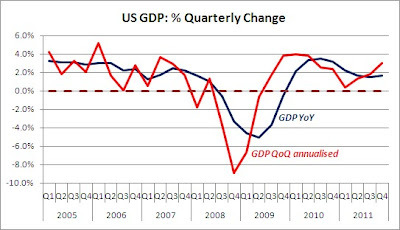 Compare this with the US GDP growth for the fourth quarter of 2011 which registered a healthy quarterly annualised growth of 3%. Some commentators have stupidly claimed that recovery is in the pipeline. Although the GDP itself is saddled with quirky ways of computation, these are nothing compared to the ridiculous massaging of the annualised number. The picture on the left depicts two versions of the quarterly GDP, and both are correct. You can guess which is the more suitable measure simply by looking at the shape of the two curves. The blue line is the quarterly GDP computed year-on-year (YoY), that is, Quarter 4, 2011 over Quarter 4, 2010. The quarterly GDP for this is 1.6%. The recently announced GDP for the same quarter at 3.0% is based on the growth of Quarter 4, 2011 over Quarter 3, 2011 (QoQ). This yields a 0.7% growth which then is compounded four times to annualise it. This method of computation generates a highly distorted trend, totally unfit for uncovering pattern. In statistics, you must smooth highly distorted measurements through the use of a longer time span or you can compute a moving average like the Case-Shiller index. With the red line, the pattern is uncertain but not so with the blue line. Since almost 71% of the US GDP is made up of personal consumption, house prices do play a significant role in influencing GDP growth. Homeowners with substantial home equity as a result of the housing boom, used that equity to take on more debt loads. Now the process has reversed itself with homeowners paying back for the sins of their over indebted past. With home prices still struggling to pick up, it's little wonder that the household sector is not contributing to any growth. As for corporations, they are sitting on a large pile of cash, not rushing to invest in an environment with plenty of capacity to spare. Obama, relishing on seemingly improving indicators, seems more confident of his reelection prospects. But lots of surprises are around the corner waiting to pounce on him in the coming months. Foremost of all is his deficit spending. If you want to know the real cause of the movements since 2009 in the Case-Shiller house price index and the quarterly GDP, the YoY version, that is, just watch the federal government deficit growth (chart above). The two metrics lag the federal debt growth by one year. The deficit spending growth is slowing and the CS house index has moved accordingly. You can guess how the soon to-be-announced GDP number for Quarter 1, 2012 will turn out. Already, corporate profits are forecast to grow at the slowest pace since the third quarter of 2009. With the federal debt as the main driver of growth since the beginning of the depression, the stock indices (see that of the S&P 500 from Bloomberg at left) have also charted a too well predictable pattern. April appears to be the pivotal month in which all indices turn on their heads. It's the nature of compound growth that it thrives on ever bigger numbers in subsequent periods. 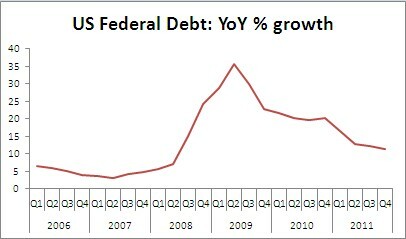 So for Obama to perk up the GDP, his deficit spending must keep on escalating. Many obstacles lie ahead at the end of 2012: expiry of Bush tax cuts, the $1.2 trillion automatic spending cuts and the end of the payroll tax cuts. All these will lead to a substantially reduced deficit. Finally, if you want to crystal-gaze into the future, the following three charts (from The Economist) using decadal averages from the 1930s to the 2000s afford indisputable long-term trends. Of course, you may argue that the 2000s is the turning point after which all measures will pick up. But remember, this depression will turn out worse than the 1930s Great Depression, and the indicators so far have yet to plumb depths deeper than those of the 1930s. 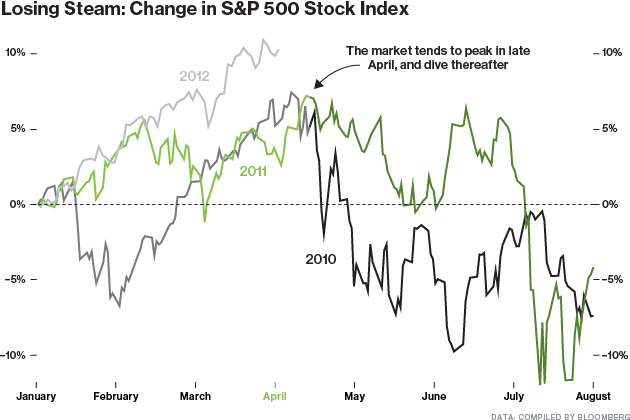 As the indicators start notching new record lows, prepare for a new reality that will upend politics and economics.